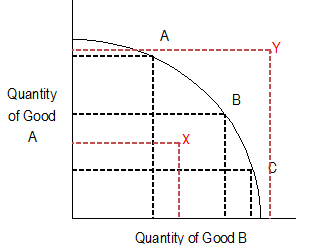 In the diagram above, point X shows unemployment of factors of production. A movement from point A to B causes more good B to be produced but there is an opportunity cost of some good A. Point Y is impossible to achieve in the short run. An expansion in the PPF will allow point Y to be achievable in the long run.